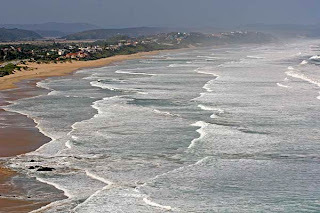 South Africa is well known for great surf, and the coastline is both dramatic and beautiful. 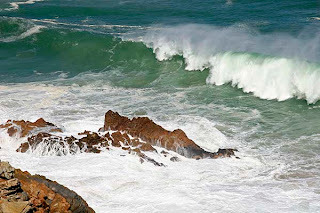 The Atlantic and the Indian Oceans here produce powerful swells and the biggest waves I have ever seen and heard. The following two images were taken from high up on a cliff as the fringes of the Atlantic plunged into the "Whale Coast" near Hermanus. 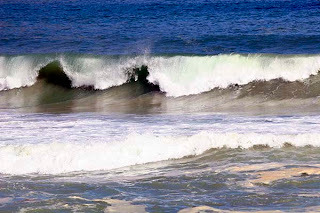 No kidding, as whales were the only beings big enough to handle these waves! 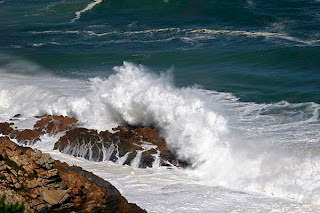 False Bay forms part of the southern Atlantic coastline of South Africa. 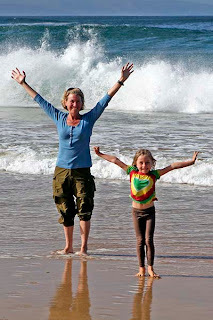 Somewhat more protected, and about 3 degrees warmer, than the west coast, Muizenberg Beach in False Bay is home to world-famous surf. 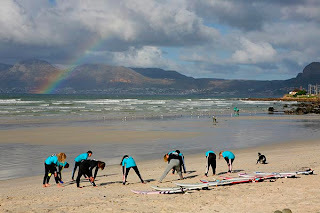 Here is a group of Roxy surf school students warming up before heading out into the winter surf. With the rainbow touching down behind them, it seemed the idyllic setting for an all-girl surf session. 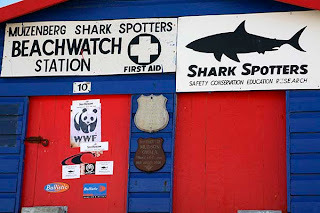 However, a few yards down the beach, signs post the dangers and realities of surfing anywhere along South African beaches! 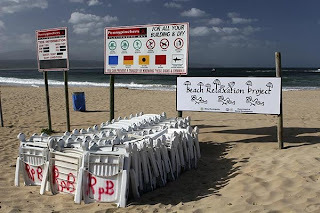 Nearby on the beach at Plett was the "Beach Relaxation Project"
Further east along the coast it continues to be awesome and impressive, and "Storm's River Mouth" was just one of the many appropriately named scenic spots along the coastal drive between Plett and Port Elizabeth. Madikwe is for the dogs!